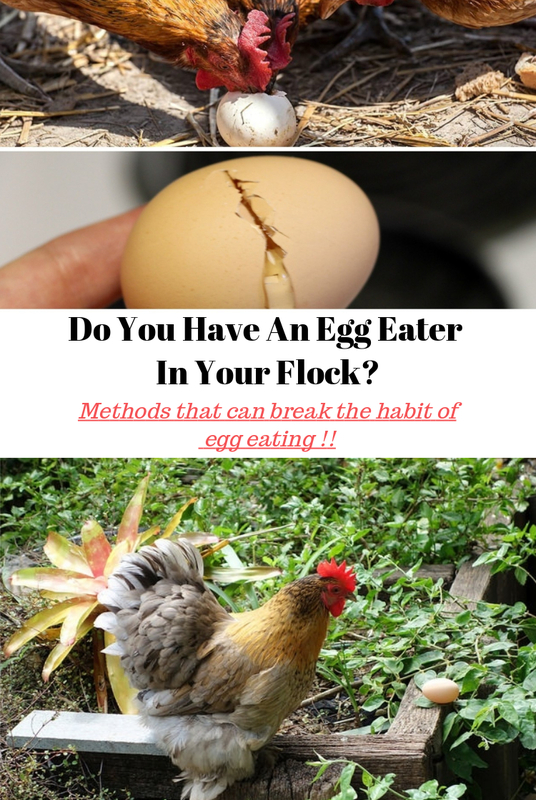 Do You Have An Egg Eater In Your Flock? Here`s How To Stop Them! May 20, 2016 September 10, 2018 - by Gold Cochin - 6 Comments. Egg eating chickens are more than common in every chicken keepers career. 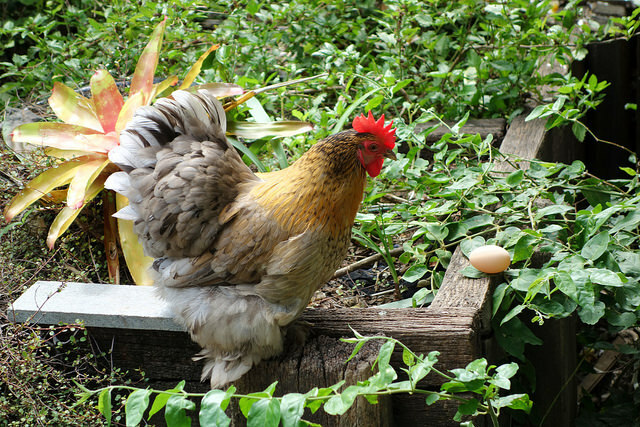 Out of curiosity or hunger, a hen can start eating eggs that she lays. For some novice chicken keeper, the sight of a hen eating her own egg can be disgusting. Luckily, we at the typesofchicken.com team have found a number of methods that can break the habit of egg eating in your chickens and we focused this article on providing our readers with them. Using Objects That Look Like An Egg To Break The Habit Usually Works. If You Know Why Your Chicken Is Eating Her Eggs You May Have The Solution Of Your Problem! Well, This Is As Simple As It Sounds – If Your Hen Cannot See The Egg How Can She Eat It? Literally, every chicken keeper we have discussed this subject with has given us this method as their first choice due to its simplicity. Poke one hole at each end of the egg using a small nail or something similar. Blow on one end until the insides of the egg come out of the other end and the egg is empty. Then fill the egg with mustard or soapy water then put it back in the nesting box. Chickens hate mustard and soapy water so when they peck at the egg they will not find it tasty and eventually stop doing it. You may need to repeat this a few times but it will work. A couple of fake eggs that are used for decoration or plain old golf balls placed in the nesting box usually work. The egg eater will peck at them and will not be able to break them this will make the egg eater eventually stop. Gather the real eggs right after the hen lays them and then place the fake eggs in order to prevent more eggs getting eaten by the egg eating hen. Repeating this process will make the egg eating hen get tired of pecking at fake eggs and plastic and that should break the habit. Chickens usually eat eggs out of two reasons – lack of protein or lack of calcium. The insides of the egg provide protein and the shells provide calcium. Check your hen`s diet and make sure that the egg eater is not at the end of the pecking order. If by any chance your chicken doesn’t get her regular doses of protein or calcium the solution is simple – upgrade your hens’ diet and she will stop eating her eggs. If you are interested in recipes for your chickens containing a lot of protein and calcium check out our recipe articles. Hang curtains around the nesting box in order to make it dark. This is a simple and easy method which will make the nesting box dark and the hen will not be able to see the egg and eat it. After a few failed attempts at finding the eggs, the hen will eventually stop eating them. Also removing the eggs from the nesting box as soon as they are out of the hen will do the trick. Previous Article Should You Keep A Rooster In Your Flock? I feed mine a little crushed oyster shell, buy it at the feed store. It contains calcium. so how does one get the mustard into the emptied egg? I broke mine by staying in the hen house (where the lay) and grabbing eggs as soon as they were laid. I’m retired, so, I’m able to do this, but I confess, it took most of three (3) days to break them! It started easily enough – when an egg found it’s way out of the nest box and onto the floor, where it landed with a crash. I didn’t see it happen, but, I do think that’s what happened. So, while I broke them by staying in the hen house and grabbing eggs (my 15 girls are quite predictable and all finish laying by a certain time m/l every day, so, it wasn’t “all day”), I also purchased medium-sized plastic pet carriers. I found them at a discount house for $10 each. I removed the wooden things I bought at Tractor Supply and replaced them with the pet carriers. I keep the straw clean in them. The birds LOVE the pet carriers for laying nests! They have areas that let them see out, they get lots of air, but there’s only one entrance/exist. Eggs can not roll out. Haven’t had that issue since – almost a year ago. BTW, fake eggs did not stop it with my hens. I didn’t know about mustard then, but, many suggested hot peppers, etc. Didn’t work. Chickens don’t mind hot foods at all. So, while not everyone can spend most of three days in the henhouse, it worked for me, along with the pet carriers for nesting boxes, which we continue to use. Everyone is happy. trim the beak back to the quick, or until it starts to bleed when she pecks the egg it will hurt, and she will stop, you will see traces of blood where she has tried to break the egg.